I have been reading the book Prodigal Christianity written by Geoff Holsclaw and David Fitch, both professors and pastors of Life on the Vine in Chicago. In it, the authors engage with Emergent and Neo-Reformed models and theologies, both affirming and seeking to go beyond or correct them, in favor of a missional model of church that has, at its core, the central affirmation of the Gospels: Jesus is Lord. 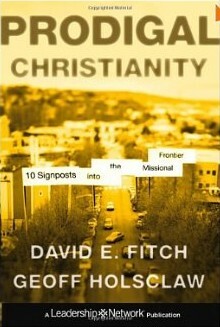 From there, the authors develop ten signposts of the church in mission, encountering today’s cultural realities. I read this book from within a primarily progressive Christian context (among my seminary and church colleagues), and thinking much about the realities of urban Boston, a beautiful and very secular city, carrying (as all cities do) much need for reconciliation. Given that context, I found this book to be a refreshing alternative to the extremes I so often see in church life. On the one hand, people are tempted to cling to certainties, close down discussion in favor of proclaiming unchanging truths, and take up a defensive posture. On the other hand (and this is the one I see more often in Boston… have been tempted to, myself), people enter into endless discussions in which minds and hearts are open but the particularity and power of faith in Christ is watered down in favor of “getting along.” Prodigal Christianity offers a language and theology for engagement with others that claims and is witness to the affirmation that Jesus is Lord (and all its implications), neither apologizing for that witness nor forcing or coercing others to accept that witness. A word is needed here about Jesus as Lord. I have many friends who do not use words like Lord, King, Kingdom in relation to faith. I agree in part with their assessment that those words tend strongly toward the patriarchal and hierarchical, and so I use them with caution. However, as the authors suggest in Prodigal Christianity, the Lordship of Jesus, the Kingdom of God, far from upholding systems of oppression, when understood rightly shed light on how far short earthly systems fall of the model of Christ. This Lordship is a relational one that subverts all hierarchical lordships. This Kingdom is one of reconciliation that subverts all kingdoms built on oppression. If our affirmation that Jesus is Lord sets up divisions, justifies imperialism, or upholds injustice, we have not, in fact, recognized Jesus as Lord but have rather, once again, set ourselves up as lords. If we are truly recognizing the Kingdom of God, justice and reconciliation will be our way of life. God help us all to step that fully into the Kingdom! Now that we have that out of the way… Geoff and David provide signposts that are just practical enough to be grounded and just theoretical enough to be freeing and flexible. They set forth a model of church that encourages mutual submission and transformation, under Christ, its Head; a church that makes justice a way of life (and not just a set of programs); a church that gathers around central rituals (like the Lord’s Supper) that form a community and shape a bone-deep practice; a church that reaches outward from a place of fearless love and desire for relationship and reconciliation; a church that is neither relativistic nor dogmatic, both courageous and humble. And all of this they base on the affirmation of Jesus’ peculiar and life-giving Lordship. They set forth a vision of small communities providing an alternative lifestyle together, a counternarrative to the dominant societal narrative. As the mainline church moves increasingly to the fringes of societal influence and gives up the last of its vestiges of hegemony, the vision they have given language to here provides a way forward that sets the church apart but does not alienate it from society. This is a delicate balance, however, as those of us in Radical Reformation based denominations can easily recognize — not one that is easy to do well. So the question this book leaves me pondering is this (especially in relation to the Church of the Brethren): How does the church enact its peculiar faith and life in such a way that it does not edge toward isolationism and make itself irrelevant? How does the church enact its radical, local, communal witness without inadvertently building of its “city on a hill” a fortress instead? Thank you, Geoff and David, for this thought provoking book. You have given clear and relevant language to a theology I hold dear, and you have provided a vision for practice that allows for that theology to bear fruit in the world. All you readers of this blog, if you’re interested in knowing more about this or getting other perspectives on this, watch the NuDunker hangout and join the chat conversation, live on Friday at 11am or watch for a link to it to be posted here sometime next week. Geoff and David, the authors, will be joining four of us CoB folks for that conversation.